NextStep Benelux is the OutSystems annual conference for the region. During the event you’ll hear about how you can experience freedom with a bold new approach to rapidly create powerful interactive mobile applications. Amazing new OutSystems features will be unveiled. You will be able to learn from OutSystems customers who’ll share their enterprise strategies and success stories utilizing Rapid Application Delivery. Additionally you’ll have access to deep insights surrounding OutSystems with our educational sessions. 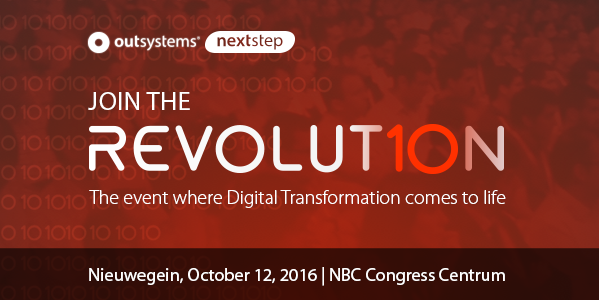 NextStep Benelux 2016 will be an incredible event for any level IT individual. CIOs, enterprise architects, developers and others to network, learn and grow! Join experts from Transfer Solutions, who will reveal their successful approach for implementing OutSystems. You will see real-life examples of customer applications and get a first-hand view of how OutSystems can drive innovation. Details on scope and size will be provided for the shown applications. Get inspired by the shared best practices and streamline your implementation of OutSystems.